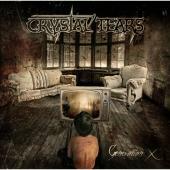 CRYSTAL TEARS was formed in the late eighties, and they debuted in 2006. Now they try to break big with Mr Ian Perry (ex. ELEGY, ex. VENGEANCE, INFINITY OVERTURE) himself on vocals. The other members are as always Greeks. The music is meaty heavy metal with down tuned guitars, double bass drumming and sing-along melodies. “Inner Spirit” opens swiftly, and sure I recognize Ian among many vocalists. As always he puts himself under pressure without sounding it. The refrain fits like a glove, and lyrics about inner strength is metal. It is important in the flood of power bands not to play everything in waltz-pace, and “Heroes” has a catchy refrain with touches of the best of the eighties. The guitar solos are to my liking, and this feels promising. Their debut video, “Nightmare Serenade”, is a good pick. The song is about a fictional killer that gets an edge to the slaughter by well produced guitars and Ian´s powerful but rather high-pitched voice. Loneliness gets a tribute in “Empty Paradise”; some power and a lot of melody makes a song that steers well clear of Kraut polka. No it is not KING DIAMOND on “Rock Until We Fall”, it´s still Ian. If it was up to me the DIO-esque hit with it´s special vocals would have been a video-too. It´s nice to have them make heavy metal like “Flesh´n´Bone” too, to make sure they don´t get the label HELLOWEEN clones. CRYSTAL TEARS are mainly from Greece and Ian has no need to copy anybody. They build up steam in album closer “The X Generation”. A lot can be said about conflicts betwixt generations, and here it is done fast, hard and melodic. They get a bit theatric too, so I believe Ian has been involved in the making of the song. The solo is neat, somewhat neoclassic, and still not. It serves as a meeting between generations of hard rockers. This is a fine album, a balance of heavy and power metal, and a meeting between Greek understanding of heavy metal and Ian Perry´s unique voice. Check it out!